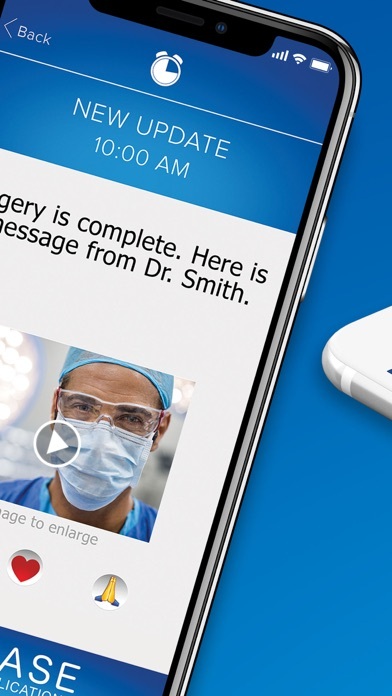 EASE (Electronic Access to Surgical Events) is a HIPAA compliant medical messaging app that allows clinicians to send updates on the status of patients via texts, photos and videos. 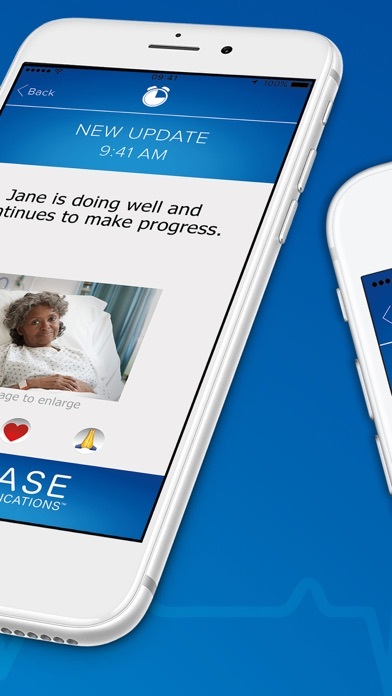 EASE Applications™ is dedicated to improving communication within healthcare and increasing satisfaction. 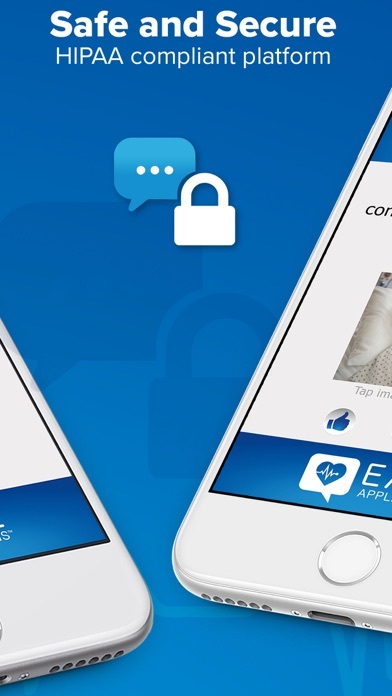 EASE enables hospitals with the power to regularly update patient families and friends via HIPAA secure messaging. The EASE App uses 3G, LTE or WiFi connections (when available). 256-bit encryption offers online banking-level security for all patient communication. With the click of a button, patients are able to add the family and friends they want to keep informed and relaxed throughout their medical procedure or hospital stay. Encrypted texts, photos and videos are sent by your medical team through a secure cloud-based server and disappear after 60 seconds. 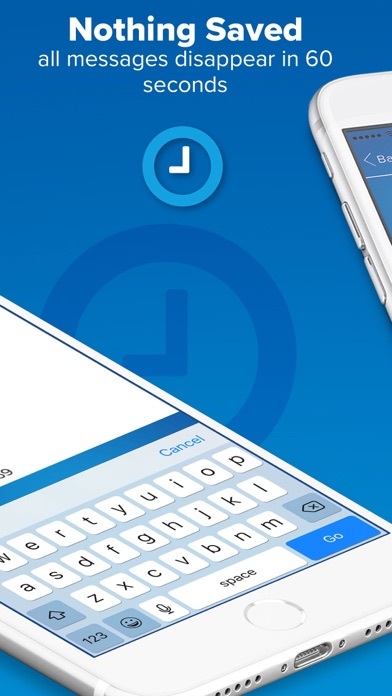 EASE App allows NOTHING to ever be stored on any mobile device. In order to receive EASE Applications updates, your medical provider must be signed up for the EASE program. ALWAYS CONNECTED, ALWAYS AT EASE. Key Features of EASE Applications™ - FREE - to a patient’s family and friends - Real-time Updates - never lose sight of your loved one - Customizable Messages - open communication reduces anxiety - Communications disappear after 60 seconds - nothing stored on mobile devices - Connect - add additional people to receive updates simultaneously - Select your preference - receive just texts, texts and photos or texts, photos and videos - 256-bit encryption - we take security seriously - HIPAA compliant - protecting patient privacy We want to hear from you. To find out availability in your area please email us at [email protected] or visit www.easeapplications.com EASE works on virtually all carriers and networks but some carrier limitations may apply. Available for tablet devices as well. I was updated throughout my wife’s entire surgery. It was amazing. I had cardiothoracic surgery this morning, and we downloaded this app, as it was suggested at check in. My family got no updates from this whatsoever after they sent the test once everyone was connected. Hospital communication has sure come a long way. I loved the app with the exception of it not being current at the end of the procedure. The messages were delivered in an incorrect order. I had one that said the doctor would see me soon, then go to the conference room, then shortly after that was all completed, was told surgery would be ending soon, and that the doctor was waiting. At this point I had already spoken to the doctor. However, during early stages of procedure, was accurate. I never thought I could leave the waiting room during my father’s surgery. We actually went to the cafeteria. This provided such comfort and relief for my entire family. Including my 2 aunts that couldn’t make it to the hospital. Amazing ! The messages come out in random order. At one point, the message said, the procedure is going fine. Very next message was that the doctor is coming out to speak to us. I swear my heart sank! I thought my father didn’t make it. 3 minutes later, the next message was that the procedure was successful and the patient is fine. My heart isn’t though. Next few messages had him going back into pre-op...after he was in recovery!! Again, my heart sank. Don’t rely on this app to inform you on the care of process of your loved ones. It’ll give YOU a coronary!! 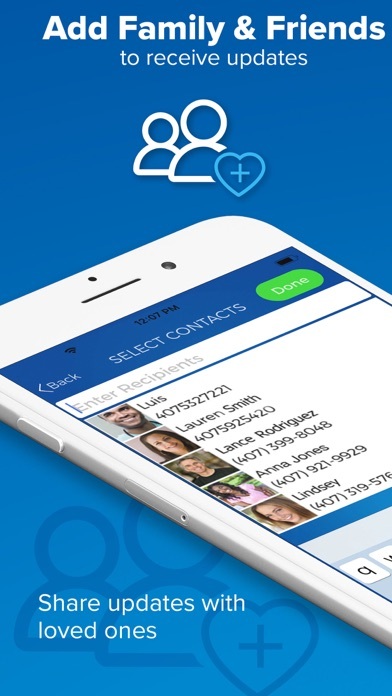 This app allowed me to stay connected to my family when I couldn’t be there. I loved seeing the updates right as they were happening. Thank you!!! Absolutely incredible use of technology. Received updates on my aunts pace maker surgery and it was incredible. I would recommend this app to everyone. EASE allowed our family to receive updates during a family member’s major medical procedure. Amazing app that reduces a lot of stress and wondering. We even had the opportunity to meet the doctor behind the app. Brilliant use of technology. A friend of mine is in the hospital and sent me a link to EASE. I downloaded it first thing in the morning and kept waiting for update following her surgery that morning. I received no alerts or updates. I thought perhaps I had not selected the right options, although I don’t remember being offered any when I first signed in. So, I thought if I delete the app and reinstall it I could check for any options on how to receive messages. BIG mistake! When I tried to log in the second time I downloaded it, it told me that name and password were already in use and would not let me use the app. It was then that I looked at the help menu and saw, in small print, that you should not delete it. The “do not delete“ warning should be in large print in the very beginning of the set up, not in the help menu which people do not always look at. Also, every other app I’ve had has allowed me to log in again after I delete and reinstall it. If you use the same login phone number and password it doesn’t make sense that you wouldn’t be able to get back in. I consider that a design flaw. In a world where everybody texts, there are some instances when sending a text just doesn’t cut it. This is one of those instances. When someone in you family is having surgery, verbal- person to person communication is a necessity. To receive a text from a nurse about a family member who was going through probably the most scariest time of their life (surgery) is insulting. Demand face-to-face communication not a text. EASE makes the waiting period significantly less painful. I was so thankful to have it during my family member’s surgery and felt I wasn’t tethered to the waiting room for the entire long procedure. I definitely recommend the experience and seeking out a hospital that has it or asking your hospital to get it. LOVED this! I was able to leave the hospital and still get updates on my father’s surgery all day, straight from the operating room! I hope every hospital adopts this practice. I tried to enter my number and the darn app would say that it was invalid. How do they think I can call or text people?!?! Terribly irritating app. For families going through surgery this app is incredible. Got updates throughout the 5 hour surgery letting me know exactly what was going on and how the surgery was going. It really helped to ease any anxiety about the situation and I’d recommend any and all hospitals utilitize this app. 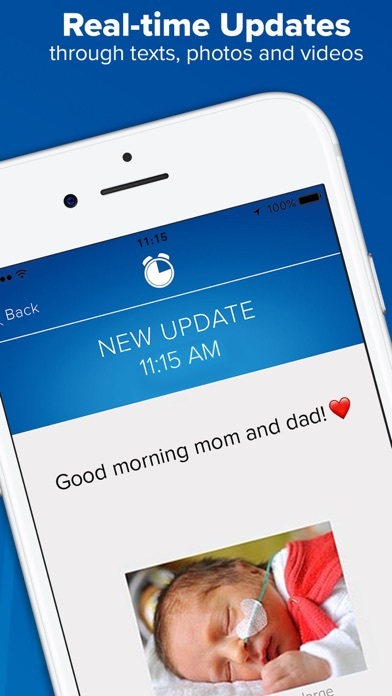 This app is the best to keep families and loved ones updated throughout surgery. Nothing compares and is a true blessing in the surgery world. All hospitals should consider offering EASE. Kudos to the creators! We’ve used Ease at Arnold Palmer Hospital several times for our son Harrison’s heart surgeries, heart caths, and one stomach surgery. It was amazing to receive photos, videos, or even just text updates during his procedures. It really helped knowing how everything was going during it all. My wife had surgery and we were told by the hospital to download the app and that it was the greatest. The day of the surgery she was admitted and the app never worked, it was showing my wife as admitted. The nurse sent an email to the app support and my wife went into surgery, the app never worked and the app support never got back to her. We had to monitor the surgery the old fashion way via asking the nurse to call. Waste of time downloading this app, I had such high expectations and it was a huge disappointment. Great piece of mind knowing what was happening in the operating room. All of my coworkers suggest this app to their patients and family. This technology is amazing.This app is quickly becoming the standard at the hospital. Loved getting updates on my son during his surgery. Thank you so much for this! How has this not been done sooner?? EASE is simple to use and I loved getting updates on my son's surgery. What a difference this made! So happy to be able to have updates of my loved ones surgery progress, even when I'm not at the hospital!! Perfect app for settling fears and anxiety, every hospital should be using this for every surgery!!! This app is phenomenal!!! I loved receiving messages of the surgery's progression!!! It is a HUGE help keeping us updated. Thank you from the bottom of my heart. 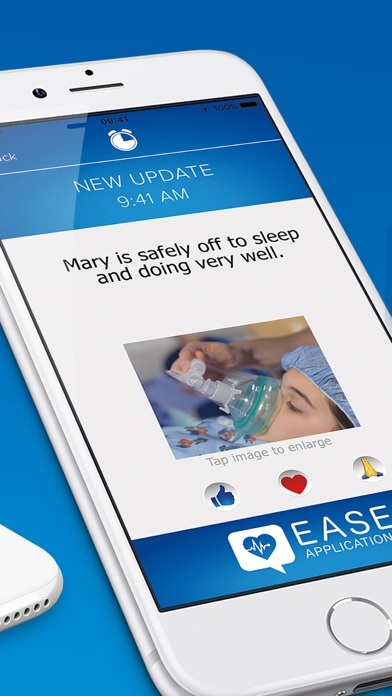 The EASE app allowed our entire family to receive updates during our daughters surgery. It was reassuring to hear throughout the entire process from anesthesia to recovery, that she was ok. We even got pictures! I can only hope that every parent is put at ease during the scariest of times as we were. Thank you for this simple but powerful method of allowing families to stay informed about their loved ones in the operating room. Communication during these critical times brings a semblance of calm while allowing the surgical teams to remain focused on the task at hand and not having to leave the OR, helping mitigate the risk of infection. A fantastic app! It was wonderful to receive updates while my child was having surgery. This app helped "ease" my worries. What a difference this made during my husband's surgery. It was so incredibly comforting to get these updates and it felt like I was with him in the surgery. Every hospital should have this. This was such a wonderful app during our daughter's heart procedure! We received updates during the procedure so we knew exactly what was going on throughout it. I highly recommend all hospitals get this to help the patients' families who are anxiously waiting and wondering how their loved one is doing. So thankful for this App. It gives you peace of mind while your love one is having surgery. What an amazing app! Those waiting rooms can seem like 1000 miles away when a loved one is having a procedure. It performs great! Highly recommended by this guy. Stuck at work during my nephews surgery and this app made me feel like I was there. Thank you to my hospital for offering this!! Amazing to get these live updates directly from the operating room! What peace of mind. Thank you, thank you! This app is great! My father has had several surgeries and each one is nerve wrecking. With this app at least we can be with him while he is in the operating room. 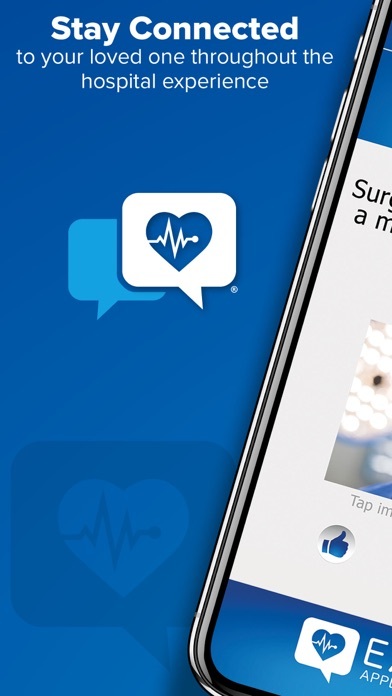 A wonderful app that gives you peace of mind while someone you love is in surgery. Ease truly made the waiting easy because we stayed connected to what is happening in operating room. Grateful to those who thought of the families anxiety and created this app! Amazing concept, perfect performance, very well laid out and super easy to use. A must have for any hospital procedure. It put our family at great ease! An incredible app that bridges the gap in communication between the parent and the OR. Having EASE was such a blessing during our baby's surgery- it was comforting to receive regular updates throughout the case and not have to wait until the surgeon came out to know how things were going. Absolutely genius. This app is amazing! My nephew was having open heart surgery and it kept us all at ease! ;) it is absolutely amazing! I was blown away to know I could get updates during surgery in real time with this app. Every parent should demand this before signing consent forms. I felt trusted and respected to know exactly what was happening during my daughter's surgery. Short of letting me wear scrubs and be in the OR, this was really, really cool. I can't express enough what it meant to have updates during my Dad's surgery. Easy to use and the updates made it so much easier. The kind of innovation that only the private sector can deliver. Parents and spouses everywhere thank you. I think this is such an amazing concept that will change healthcare and dramatically improve doctor patient relationships. I hope my hospital will use this! This application will truly put you at ease when your loved one is having a surgery or procedure. It completely changed my hospital experience for the better. So grateful that this service was available to me! Brilliant application that provides peace of mind with regular updates in real time instead of you just having to wait in anticipation of the outcome of a procedure.